For many, the 1970s decade is one that they don’t remember or may not want to remember. It was a decade of high inflation, skyrocketing gasoline prices, and the near death of the performance car. This was the decade that gave us Richard Nixon, Gerald Ford, and Jimmy Carter – all names, we would like to forget. But on the flip side of the coin it was a very memorable decade, after-all who could forget Disco music, Star Wars, those popular 1970s TV sitcoms, and some very interesting automobiles. The 1970s brought together some of the most diverse automobile offerings ever seen. It was a time when super large American cars could still be purchased new, yet compact cars were beginning to hit the roads in large numbers, and there was a massive influx of foreign automobiles from Europe and Japan. Of all the many car offerings during the 1970s, here’s a list of the five most significant. During the entire 1970s decade the Pontiac Trans Am was the only American performance car that remained true to its roots. It began the decade with its two engine offerings being high-performance 400 cubic-inch V8s and it ended the decade with a performance oriented 400 cubic-inch V8 as its top engine option. During the 1970s there were even different 455 cubic-inch V8s offered in the Trans Am for 6 model years. The Ford Mustang during the 1970s turned into the Ford Pinto sized Mustang II and even the Camaro Z28 disappeared for a few years. However the Trans Am stood strong and throughout the 1970s sales grew until 1979 when yearly sales hit an all-time high of 116,535 units. Not bad for a car that started the decade with only 3,196 units produced for the 1970 model year. Even in a downtrodden performance era the Trans Am still delivered a solid performance punch in 1979 when equipped with the optional 220 horsepower and 320 lb-ft of torque W72 400 cubic-inch V8. With a 6.7 second 0-60 mph time and a quarter mile time of 14.67 seconds at 96.6 mph (as tested by Hot Rod magazine in March 1979), the 1979 W72 Trans Am was the best performing American car of the late-1970s. As a comparison Hot Rod magazine back in the day tested the ultimate Trans Am of the 1970s, the Super Duty 455 cubic-inch V8 powered 1973 Trans Am and obtained a quarter mile time of 13.54 seconds at 104.3 mph. The 1979 Trans Am Hot Rod tested 6 years later in 1979 was only 1.1 seconds slower in the quarter mile, not too shabby considering the 1979 was saddled with power robbing engine pollution control devices and had 55 less cubic inches of engine displacement. Additionally with its optional WS6 suspension package, the big heavy 1979 Trans that weighed around 3,800-lbs, was as light as feather in the turns with a .81 g skidpad. 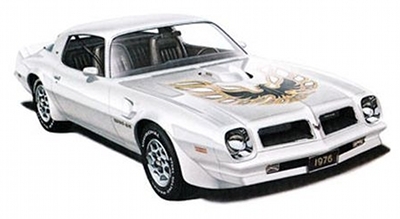 Not to mention the WS6 equipped 1979 Trans Am could stop on a dime with its new for 1979, 4-wheel disc brakes. The Trans Am’s superior performance wasn’t just a one year occurrence, just about every year during the 1970s, the Trans Am was beating the competition. The Trans Am is significant because it kept the rear-wheel drive V8 powered American performance car alive. It showed all the other automakers that customers still wanted a fast and flashy performance car. If the Trans Am hadn’t remained true to its roots during this time of great performance malaise, the rear-wheel drive V8 powered American performance car could have gone the way of the dinosaurs. We have the Trans Am to thank for the current crop of V8 powered late-model American muscle cars. 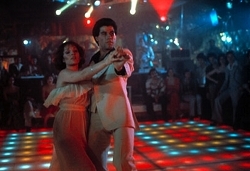 The flashback to the 1970s has forever been immortalized with images of Elvis in his glistening white jumpsuit, John Travolta Disco dancing in the mega hit movie Saturday Night Fever (1977), and the Trans Am wearing its flashy exterior colors, wild spoilers, shaker hood scoop, and the wild big bird decal on the hood. Maybe the 1970s decade wasn’t so bad after-all. When most classic car aficionados, think of the Ford Thunderbird it evokes thoughts of the 2-seat 1955-1957 Thunderbird, 1958-1960 (square) Thunderbird, 1961-1963 (bullet) Thunderbird, or the elegantly styled 1964-1966 Thunderbird. Not many will think first of the 1970s era Thunderbird offerings, however they were extremely significant. The reason being was the Thunderbird exemplified the quintessential 1970s luxury barge. It was the big luxury car that offered a lot of goodies for a reasonable price and buyers couldn’t get enough of what the Thunderbird had to offer. It all started with the 1967 Thunderbird which was a radical u-turn from the 1966 Thunderbird. For 1967, it grew larger and a 4-door model was added to the lineup. The 2-door model was still the popular body style and would stay the long haul, the 4-door model ceased production when the 1971 model year ended. The long hood and short decklid styling of the 2-door 1967-1971 Thunderbird would be copied by so many 2-door luxury coupes in the 1970s. And the Thunderbird got even bigger in 1972 – the hood was longer and the decklid in comparison to the gigantic hood looked extremely short (just what customers wanted). While muscle cars had been the popular ticket in the 1960s, stricter government regulations, new emissions standards, and higher gasoline prices of the 1970s redirected more affluent buyers to 2-door luxury coupes and just about every American automobile brand by the mid-1970s offered at least one if not multiple offerings in this very popular market segment. Since buyers could no longer have a high-compression V8 under the hood, they instead opted for plush interiors and opulent luxury options. They no longer wanted a fast convertible or coupe but a big massive rear-wheel drive 2-door luxury car with elegant lines, more luxury options than they could imagine, and a smooth accelerating torquey V8 engine. When the massive 1972-1976 Thunderbird ended production, Ford for 1977 replaced it with a smaller but still large Thunderbird with finely sculpted lines that still had the long hood and short decklid styling, it was a massive sales success. The Thunderbird had started off the decade with 2-door 1970 Thunderbird production of 41,963 units but production would skyrocket by the end of the decade. For 1978 alone, total Thunderbird production was 352,751 units. It was unthinkable that the Thunderbird which was always considered a speciality 2-door luxury car could sell this many units in one model year. Unfortunately the party would not last forever, Ford was forced to downsize again in 1980 and then make radical styling changes in 1983. Ford in 1983 took a big u-turn and went the aerodynamic styling route in order to get sales back on-track for several years. 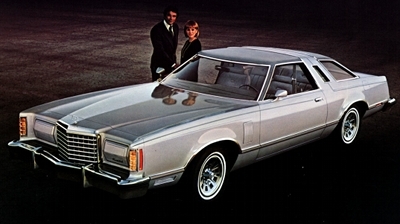 The Ford Thunderbird is a car name rich in history, so it should never be forgotten that during the 1970s decade it was the king of the 2-door luxury barges. It can’t be stressed enough how important the Honda Accord Compound Vortex Controlled Combustion (CVCC) was to the automobile industry back in the 1970s. The CVCC 1.6 liter 4-cylinder was extremely fuel efficient and very clean burning – so much so that it didn’t need a catalytic converter in the U.S. market like most cars were mandated to have. Nothing was the same in the automobile industry after the introduction of the Honda Accord CVCC – it was a gigantic game changer. 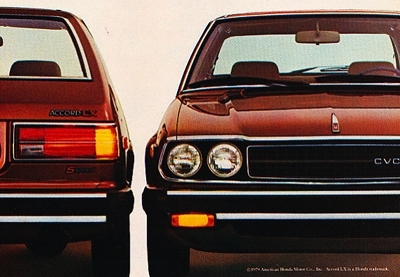 During the early-1970s, all the Japanese automobile brands were looked upon as being a joke. Toyota, Honda, Datsun (now called Nissan), and Mazda all competed in a small market segment selling mostly inexpensive micro-sized cars. Most who bought these cars did so in order to save money on gas or didn’t have enough money for a new larger American car. These brands at the time were building up a loyal following and sales steadily increased. One big problem was these cars may have worked well for a single person or for a family as a commuter car, however they were just too small and had very limited cargo capacity to be used on long family trips or for other utilitarian means. These early Japanese import cars were for the most part very fuel efficient and reliable transportation that had styling as appealing as Soviet era Eastern Block cars. Well this all changed upon the release of the all-new 1976 Honda Accord CVCC. It was the first Japanese import family type car that you actually wanted to be seen driving. Its 68 horsepower horsepower CVCC SOHC 1.6 liter 4-cylinder may not have been fast, propelling the Accord 0-60 mph in 13.8 seconds, however it gave the Accord an EPA highway rating of 44 mpg (a figure that is only 4 mpg less than the EPA highway rating of a 2013 Toyota Prius). The Accord CVCC also had an inexpensive purchase price, it had attractive styling, and could fit four adults fairly comfortably even though it was a compact car. The Accord was front-wheel drive in an era when most cars including compacts had not yet converted to this type of drivetrain configuration. Honda didn’t just stop there, it offered in the Accord air conditioning, cloth seats, and many other options which were not usually found on small cars back then. The Accord was available in two body styles, a 2-door hatchback and 4-door sedan (which was added for the 1978 model year). Honda also offered a LX model (a top-level luxury interior trim package) which gave buyers something to brag about. The Accord was an instant hit with buyers, and its popularity went into the stratosphere by the 1980s. Over the years the Accord has grown in size, today it’s a large car in comparison to the original. Currently it’s one of the best selling cars in America. Without the 1970s Accord, Japanese automakers may never have gotten such a strong foothold in the U.S. automotive market. No GM division was in a worse position than Cadillac when the 1973 Oil Crises hit which sent gasoline prices skyrocketing. Cadillac had a whole fleet of gas guzzler oversized cars. Unfortunately Cadillac’s business formula since WWII had been continually offering bigger and bigger cars with the most luxury and state-of-the-art options available. It worked for about 30 years, until the big slap in the face occurred in 1973. Cadillac to its credit responded quickly with the 1976 Seville which was loosely based on the Chevrolet Nova’s GM X-body platform. Cadillac engineers came up with the new N-body which was a modified X-body platform. The 1976 Seville was designed from the ground up from scratch on this new N-body platform. The Seville was 2 1/2 feet shorter in length than the 1976 Fleetwood Brougham (204 inches versus the Fleetwood’s 234 inches). By 1976 standards the Seville was a small car. This wasn’t the first time an automaker had released a smaller car however it was the first time a smaller 4-door car was offered and the price was substantially higher than all the bigger car offerings from the same automaker. This was a bold move, since the mindset of most back then was that when you paid more you got a larger car. It was just like buying a house, nobody wanted to pay more money for a house with less square footage. However even though the Seville had a base sticker price of $12,479 versus the $10,935 of Fleetwood Brougham (Cadillac’s most expensive large car), buyers took an instant liking to the Seville. The key to the Seville’s success was its very distinctive and attractive styling along with its unsurpassed luxury amenities in the interior cabin. Adding to this was Cadillac spared no cost in offering the finest state-of-the-art electronics with digital readouts that 1976 could provide. And a 180 horsepower Oldsmobile 350 cubic-inch V8 with Cadillac engineered port fuel injection was icing on the cake. All these amenities gave buyers the feeling they were getting a lot for the money even if the car wasn’t that big. The Seville even with its hefty price tag was a big sales success, 43,772 were sold the first year which was almost double the amount of Fleetwood Broughams sold the same year. The Seville allowed Cadillac to adjust to the times. The launch of the 1976 Seville and later the successful downsizing of Cadillac’s full-size lineup for 1977, kept Cadillac on top until the mid-1980s when Cadillac downsized everything again to ultra micro size (a mistake from which Cadillac has never fully recovered). in the 1970s the Seville managed to lure many buyers away from Mercedes dealerships which was exactly what Cadillac upper management had hoped for. The Seville forced many to change their perception that it was possible to get more with an attractive smaller car loaded with plenty of luxury options (provided the car wasn’t shrunk too small in size). The Datsun (former name of U.S. market Nissan cars) Z-car wasn’t the first Japanese sports car but the first one that many American buyers truly wanted to own. And who could blame these buyers? The Datsun Z-car had the top-notch sports car looks of the 2-seat Jaguar XKE for a fraction of the cost. And even in its first year available in the U.S., the 2-seat 1970 Datsun 240Z had true sports car acceleration and handling. The 240Z had standard front disc brakes (and rear drums) and a 4-wheel independent suspension. It may have only had a 151 horsepower 2.4 liter (146 CID) SOHC straight-6 cylinder motor for this first year but it could sprint 0-60 mph in about 8 seconds. A reasonably quick figure considering the 240Z had half the horsepower of the base engine in the 1970 Corvette – the 300 horsepower 350 CID V8. The main reason for the quick acceleration was its weight of just a little under 2,400 lbs. The 240Z also topped out at 125 mph which was also rather impressive. Even so, where the 240Z really shined was in the handling department. And all of this good stuff was available for a base price of around $3,500. This was nothing short of earth shattering, $3,500 in 1970 (U.S) dollars adjusted for inflation equals $21,063 in 2013. Can you imagine here in 2013 purchasing one of the best looking, best handling, and quick accelerating sports cars for $21,063? Quite simply, it’s not going to happen. Even Nissan’s lowest price 2013 370Z (which is the current heir to the original Z-car throne) starts at $34,420. Datsun continued to provide fast acceleration and excellent handling throughout the 1970s. The 260Z with a 2.6 liter 6-cylinder replaced the 240Z and later the 280Z with a 2.8 liter 6-cylinder replaced the 260Z. Even when performance died for most cars during the 1970s, the Z-car could be counted on to provide plenty of performance for a very low price. And Nissan by the mid-1970s released a 2+2 version of the Z-car (that had a stretched wheelbase) which further increased sales. 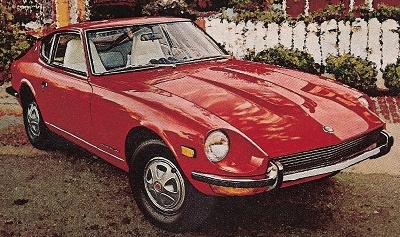 The Z-car in the 1970s opened the door for other reasonably priced Japanese sports cars. It became more refined and luxurious as the 1970s decade progressed. Sales started off good at 17,005 units for the 1970 model year and finished off the decade in 1979 at a whopping 86,007 units. Unfortunately in the 1980s the Z-car got pricey hence sales would drop considerably by the late-1980s. Nissan tried to get the original Z-car magic back in the 1980s with the affordable 240SX sports car, buyers weren’t impressed. Nissan would never again offer so much sports car for so little money as it did in the 1970s. Any average buyer could afford a world class sports car back in the 1970s with the Z-car – a phenomenon that will probably never happen again.